Whoa. That’s all I have to say about these babes. Get your taste buds ready. We’re going for a ride. 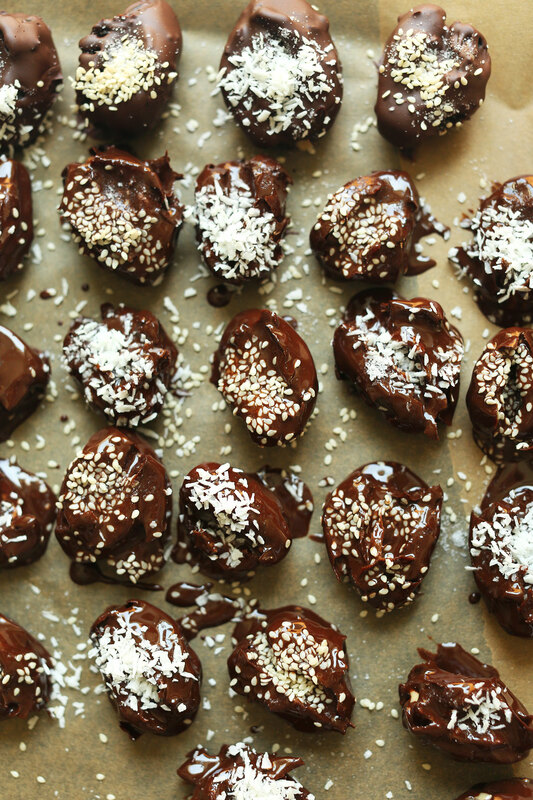 Inspiration struck after trying Wolf & Bear’s “bunny balls,” which are essentially a date truffle with tahini and cacao powder. Because the flavors weren’t as pronounced as I’d like, I decided to deconstruct them. 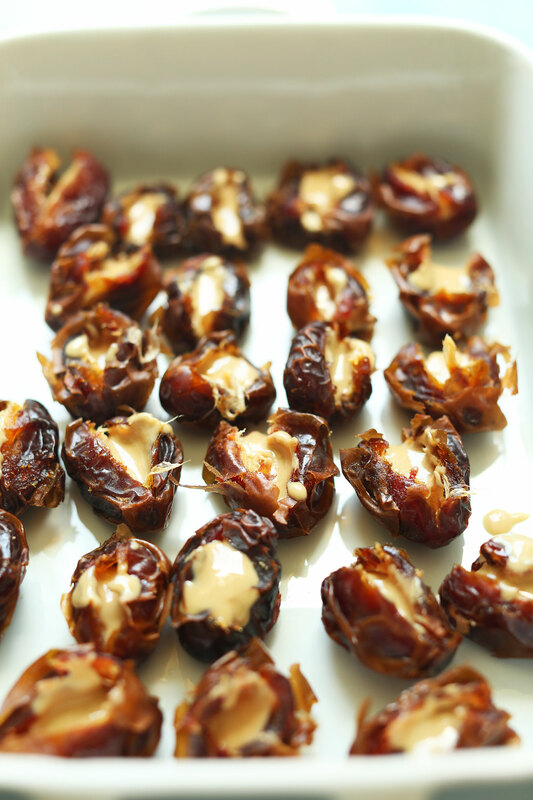 I kept the dates whole, stuffed each one with as much tahini as possible (almost 1 teaspoon each! 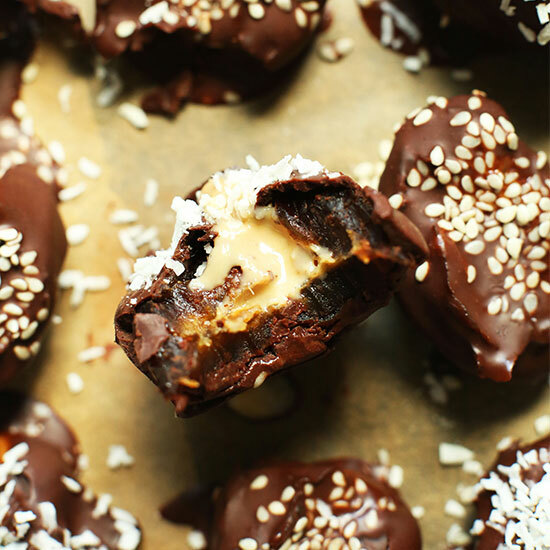 ), and then dunked them in my Easy Vegan Chocolate, which is naturally sweetened to taste and absolutely perfect for these tahini bombs. I just like saying tahini bombs. Can you tell? If you’re intimidated by making chocolate, don’t be. If I can do it, you can do it. It does require cocoa butter, which is super easy to work with and also featured in my White Chocolate Lemon Cheesecakes, Easy Vegan Chocolate, and Raw Double Chocolate Macaroons. What I’m saying is: Invest in a block and it won’t go to waste around here (wink wink). Not to worry if you can’t procure cocoa butter though – I include a workaround in the notes. These dates require just 8 ingredients and about 30 minutes to make. They’re ready to enjoy right away, or can be frozen or refrigerated to keep fresh up to 1 month. In other words, a little effort for a lot of reward. These would make the perfect dessert for summer get-togethers, dinner parties, or hosting events. They also make fun gifts! Edible gifts are the best gifts in my opinion. If you try this recipe, let us know what you think! We love your comments, ratings, and especially your photos tagged #minimalistbaker on Instagram. Cheers, friends! A decadent yet healthy 30-minute vegan dessert! 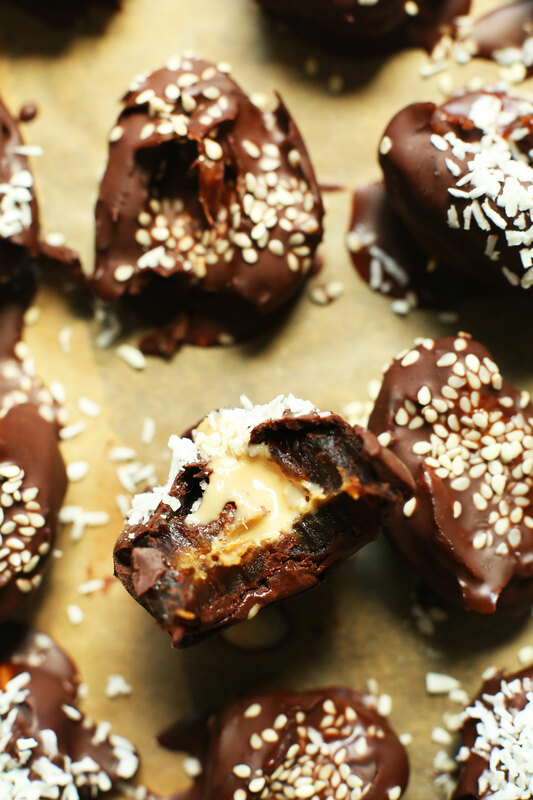 Fresh dates stuffed with tahini, dipped in DIY 4-ingredient chocolate, and sprinkled with coconut and sesame seeds. Add 2 inches of water to a medium saucepan and bring to a rolling simmer over medium-high heat. Then reduce heat to medium and set a medium glass or ceramic mixing bowl on top, making sure it's not touching the water (this creates a "double boiler"). 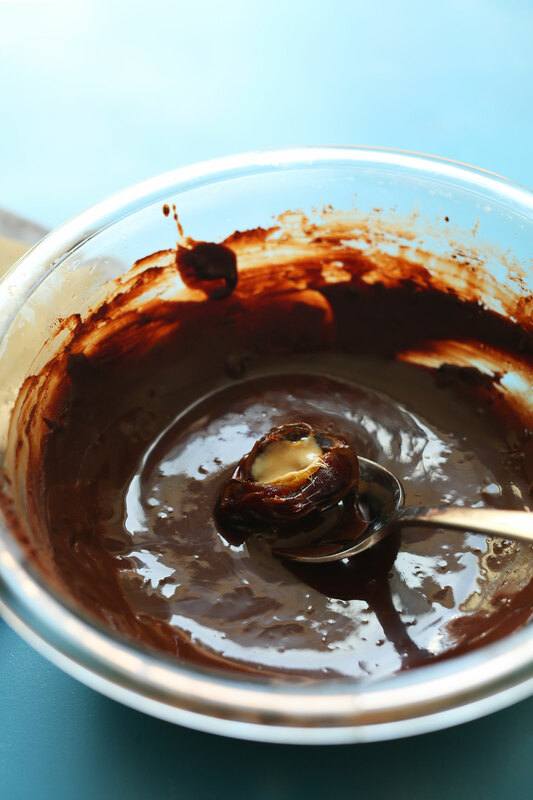 To the mixing bowl, add finely chopped cocoa butter and coconut oil and let melt, stirring occasionally with a wooden spoon or whisk - about 2-3 minutes. Once melted, carefully remove bowl from heat (turn off stove top) and add the maple syrup and cacao or cocoa powder. 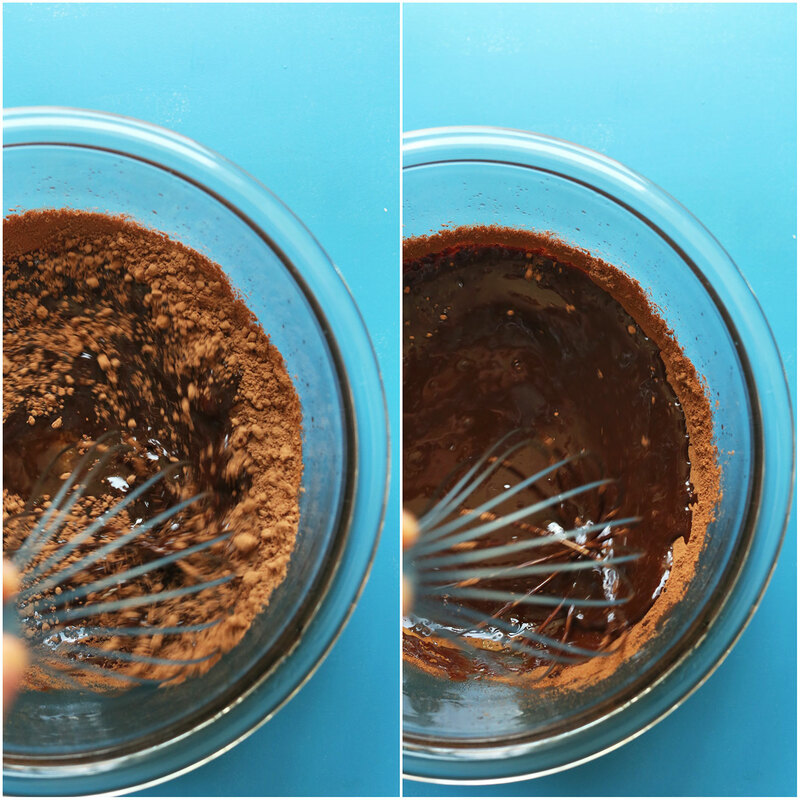 Use a whisk or wooden spoon to mix until fluid and thoroughly combined. Taste and adjust flavor as needed. I added about 2 Tablespoons maple syrup total (amount as original recipe is written // adjust if altering batch size), but it’s completely up to how sweet you prefer your chocolate. Because the chocolate is quite thin at this point, set in the refrigerator to chill and slightly thicken and make dipping the dates easier - about 15-20 minutes total, removing to stir/whisk occasionally. You'll know it's ready when it's more like pourable hot fudge than melted coconut oil. Next, carefully remove pits from dates and be careful to keep one side of the date intact, as opposed to splitting it into two separate pieces. You're trying to create a small crevice in the date (see photo) so it's easy to add/contain the tahini. Once pitted, fill with tahini - about 1/2 - 1 tsp depending on size of date. Add dates to a parchment-lined baking sheet and pop in freezer to chill while chocolate thickens. 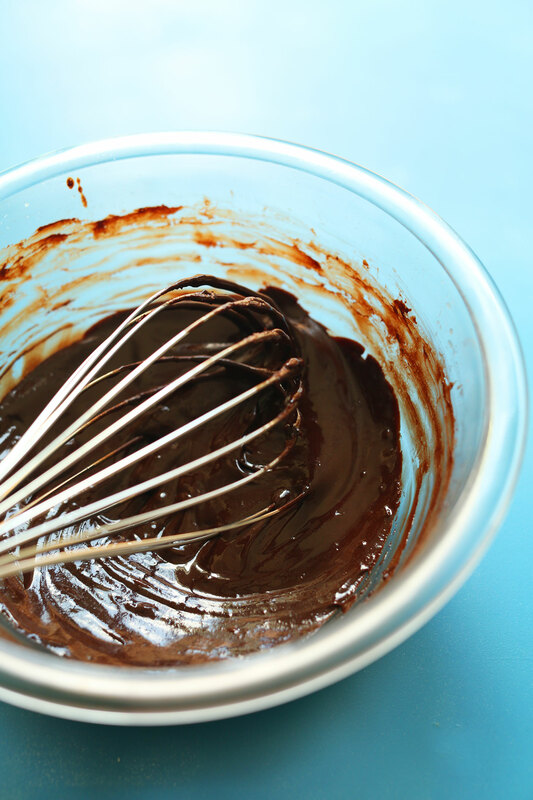 Once chocolate has thickened (if it got too thick, briefly microwave or set back over the double boiler to thin), add one date at a time and flip with a slotted spoon or fork to fully coat, then tap off any excess chocolate. Set back on the parchment baking sheet and immediately sprinkle with a little sea salt and either sesame seeds or coconut. Repeat until all dates are coated. Enjoy immediately. Store leftovers in the refrigerator for 1 week or the freezer for 1 month. Let come to room temperature before enjoying for best flavor/texture. *If you don’t have cocoa butter, simply sub all of the ingredients for 1 1/4 cup (150 g) chopped dark vegan chocolate + 1 Tbsp (15 g) coconut oil (amount as original recipe is written // adjust if altering batch size) and melt in the microwave in 30 second increments or over a double boiler on the stovetop. No need to refrigerate - it will already be thick enough for dipping as is. *Nutrition information is a rough estimate calculated using all of the tahini and chocolate. Tyhini stuffed zucchini another wonderful recipe. This recipe is amazing and I adore this web page. Thank you so much, I actually like your entries rather than skipping them and I am so delighted with the creativity and love that you put in. I also am just so grateful you decided to share tahini in a dessert as I am completely obsessed with it alone. All the best love. These are great and easy to make. I noticed you have to keep them in a cold place like the frig or the tahini and chocolate get really runny. Another awesome recipe by you! Made these yesterday as dessert for my upcoming birthday dinner. Love that they can be made a few days in advance! As suggested by another commenter, I added sesame seeds to the tahini for extra crunch. I also added the salt directly to the filling for better distribution, melted dairy-free dark chocolate instead of making it from scratch & worked with dates that came already pitted. Super easy, looking fancy & sooooooo yummy – thanks, Dana! Yay! We are so glad you enjoyed these, Yulca! Yesssss! Im obsessed with tahini so I absolutely loved these! I also made some with peanut butter for some of my family who are not a fan of the bitterness of tahini, but for me, it works so well with the sweetness of the dates and chocolate! I would love to try this recipe, but do you have a recommendation for a good substitute for coconut oil? Thanks so much! A truly decadent and sweet snack! Perfect for converting junk-food addicts. I posted a picture on my Facebook and tagged MB in it. Thank you for your work on this recipe! My son and I made these for his gardening group snack. I’m stuffed after several samples to make sure they would be good. We can’t wait to make these beauties again for holiday gifts to the neighbors. Sharing the love! I substituted coconut butter mixed with shredded unsweetened coconut for the filling. It gave them a nice crunchiness at the center. This looks amazing….is there a way to make it work if you only have chopped dates? Why did I wait so long to make these?! OMG, new favorite dessert! I cheated and melted dark chocolate instead of making my own, so I can only image how good these taste when you make your own chocolate coating. YUM!! love these so much. the tahini is a perfect balance to all the sweetness i think! Could you use cacao butter instead of cocoa butter? Looking forward to making these! These are a great Paleo snack! Thank you! These are SO good! But they KILL my teeth because they are so sweet. Dang dates! I stuffed mine with natural peanut butter. They make great gifts, too. I made these tonight and they were wonderful! I used dark chocolate in a bag I got from my local grocery store and;melted that over a double boiler. I used toasted sesame seeds and sea salt. This is a wonderful recipie. My weekend candy! These are ridiculous! They didn’t sound good to me, but I had an excess of Medjool dates (i know, lucky, right?) and a holiday party coming up, so I did a test run. I made 5 and asked for testers. Once the chocolate was dry, I took a bite and knew I needed no more testers! Amazing! I made about 30 for the party and brought none home! I used Trader Joe’s semi-sweet chocolate chips (they are dairy free) and coconut oil for the chocolate-your recipe from another dessert-I love how easy it is and how good the chocolate is! Thanks again for another amazing, super easy, staple recipe! Made them last night and I’m officially addicted. Do you make the Tahini first? I.e. Add water, lemon etc or do you use the tahini raw? Can’t wait to try these! These have been on my list for a while. Currently regretting making them only because they are SO good – can’t stop eating them! Filling the dates was a little tedious, but they are so worth it. Thanks for another great recipe, Dana! I am currently living in Iraq and dated are CHEAP so I wanted to find a good recipe for them. This was it! It was delicious! The tahini balanced the sweetness of the date and I added a few flakes of sea salt at the end that really made the dark chocolate taste perfect. Great recipe. I can’t even stand how delicious these are! Sweet, savory, a little nutty. I have to say I have made these Date Bombs 3 times in 10 days. Twice for dessert when friends came for dinner and once just for the fam!!!! These are really the BOMBBB!! I can’t tell you how delicious these are. I did cheat and melted Dove Dark chocolate for the chocolate coating cuz I was in a hurry, but these are a real favorite and will be at my house frequently! Thanks Dana for a great blog. New comer but can’t get enough of your recipes! ummm, yummy …..it looks damn delicious. These honestly look like they’re the BOMB DOT COM. 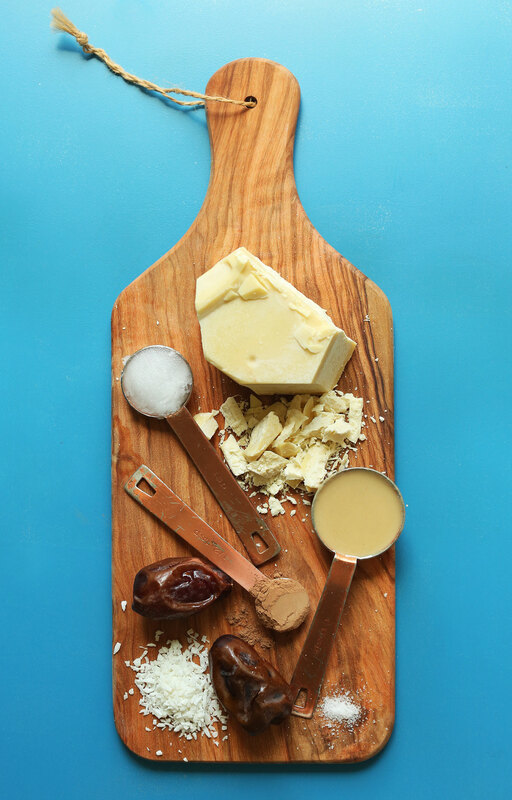 Tahini tastes so much better with dates than peanut butter in my opinion! Need these little bombs in my life… like ASAP. These look so delicious, thanks for sharing! I have to admit I’m not the biggest tahini fan, so I might try these with some almond or peanut butter, I can’t wait! A really common traditional dish in the Middle East are dates stuffed with halva (a dense, crumbly dessert made of sesame flour, honey and sometimes pistachios, chocolate, or other flavorings). I have a feeling you’d really love it. Ooh, nice! Thanks for sharing! Yesss! Stuffed dates are the best :) I usually stuff mine with peanut butter. These looks amazing – I can’t wait to give these a try!! These would be great for a shower I’m hosting. So, where do I find cocoa butter…just the local grocery? And where would it be located in the store? And desiccated coconut…what’s that? I can just buy a jar of raw tahini butter, right? This is unchartered territory for me, so I appreciate your help. Thank you, Lucia! Have a great week! I always get mine on Amazon – link above! They also may have some at Whole Foods. WHAT?! On the list~ Thanks for sharing! Brilliant… just brilliant!.. Can’t wait to make these bad boys! Does anyone have a way to order cocoa butter in bulk, or something that will lower the price? The best price I’ve been able to find is eleven dollars a pound (https://smile.amazon.com/Terrasoul-Superfoods-Organic-Butter-Pounds/dp/B015JN6E66), but that’s still outside my budget. Must I continue to salivate over raw chocolate unsatisfied, or can anyone help me? You can make your own simply with unsweetened coconut and a food processor. Just put it in and buzz until it is smooth – probably about 20 minutes or so. That’s coconut butter. Cocoa butter comes from the cacao bean ? Oh true. I guess that changes the recipe for me. WHOA is exactly the first word that came to my mind too! The cocoa butter just puts these over the top, I love that stuff. I’m not sure I can be trusted around an entire batch of these lol. Ha! Thanks. Hope you love these, Natalie! I made some tahini yesterday with inspiration from your site, it did take 40 minutes in the thermomix though :( But I will definitely try these soon! Love all your work so so much!! These stuffed dates look amazing! I think they will be perfect for our next picnic or church potluck! Can’t wait to try them. Thanks for sharing them. Well I’m heading to your church then!!! Then do look most excellent and a fun project this afternoon, it’s pouring cats and dogs rights now. First rain we’ve had all summer.